Now you can finally get a good look on the layout too. Looks short but still quite fun. I really hope this will kick off a new wooden coaster run for the UK. Layout looks fun, think it'll definitely have it's moments, fire effects should add to the ride too! Yeah that layout looks beautiful. The first drop, second airhill, swooping turn down the slope is going to be a sweet sequence, especially in the back row. It almost creates a double-down effect. It will be a very nice little wood coaster, they planned it out well. ^ Neither big nor small, IMO, but it's worth expecting for a better on-ride video! Way to go! Why is everything in Alton Towers so dark, even the family coasters have a dark theme except spinball. I would also like to know the reasoning behind this. I just wonder if they find it easier to market this type of attraction when it has a theme like this, in the UK? It would be a nice change to have something a little different. You do also have Air/Galactica, I suppose, which at the very least is hot some type of "horror" theme. Plus, if it's a dark theme, they don't have to pay to keep it looking fresh. The age and related wear and tear 'adds' to the 'theme'. On a serious note, it would be nice to have something fresh and cheery as a theme for a change. People like being scared apparently. I imagine they've undertaken market research on this kind of thing and scarefest and halloween are pretty popular in the UK I guess. Could be worse, could've built a bright red Nemesis on top of the back car park? Or a bright white Nemesis where the old Nemesis used to b... oh wait. I've been thinking, what do people think the queue system will be like? Could it be like the Smilers' (the main queue, and a combined Fastrack, Disabled and Single Rider queue which then splits into 3 separate queues), or different? From looking at aerial pictures and plans, it seems like SW8 will have a main queue (right at the archway entrance), a fastrack (left at the archway entrance) and a disabled queue that enters via/by the shop. I don't think there will be a single rider for SW8 from what we've seen. ^ I really hope that disabled guests (including myself) don't have to enter via the shop; surely that would miss out the pre-show? The one on the left that curves around and meets the preshow building at the bottom is the Fastrack queue. The right hand one is the main queue, and the middle one that leads into the middle of the site is a vehicle access road, that may yet be public access for ride viewing. I think the whole fire thing is cool albeit a bit gimmicky and no POV? Wait, didn't Terminator the ride at Six Flags Magic Mountain used to have fire at the ride? Last edited by herman116 on January 8th, 2018, 12:41 am, edited 2 times in total. They actually are using the phrase in the press that it's the World's first fusion between wood and fire. Wodan also had fire effects at the top of the lift. "From the park that brought you Smiler, the super intense roller coaster that ended up crushing a girl's legs off in a horrific mind scarring hours long nightmare, comes a wooden roller coaster FUSED (thier actual word) with fire... Themed to a torture/murder sacrifice cult!" Why would GCI even agree to this? I'm sure it would be an amazing roller coaster without this, and it's gotta be costly because fire needs fuel and that's a continual cost, but I feel like out of everything the could have come up with this had to be the worst possible idea for everybody involved for a gimmick. Keep in mind that Alton wants to provide something new for every single new coaster they put in, and i guess this was their only option they had when working with a woodie manufacturer, especially since nothing outstanding happens with any wooden coasters except for ones by RMC. I could have seen them going for something better, but even if it's going to be what we think it's gonna be it's still going to be pretty cool. 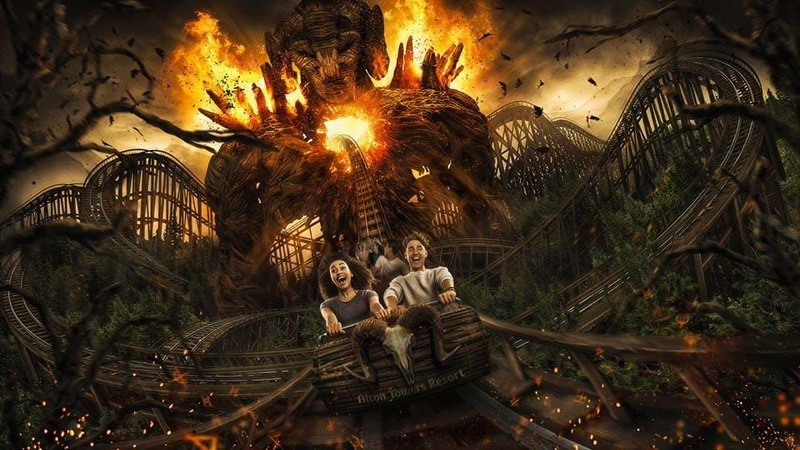 Alton Towers Wooden Coaster CONFIRMED! Alton Towers - SW7 - "The Smiler"
New Flat at Alton Towers?